Rarely does a movie live of to my expectations if I've read the book. Especially, if I loved the book. 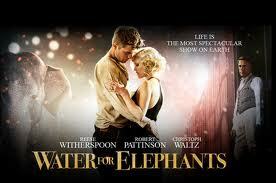 The movie version of Water for Elephants really did a great job fulfilling my vision of the book. They did a wonderful job capturing the times and the gritty reality of the traveling circus as they went from town to town struggling to survive during the depression years. Brilliant casting was Christoph Waltz as August. Perfect. Other great casting was Rosie the elephant. You truly do fall in love with her. She really did convey her personality. Did I really believe the relationship between Marlena (Reese Witherspoon) and Jacob (Robert Pattison)... no, not really, but that didn't hurt the story telling. It was a very well done movie. It was also great to see Hal Holbrook again. Another great casting choice. oh goodie! I also loved the book and was hoping it would live up to it. Not crazy about Reese - and Robert Pattison is a little...vampirey for me, but I trust you and will check it out! Wendy - I have to say while reading the book, Reese never came to mind as Marlena, but Pattison does shake off the vampirey thing pretty well to become Jacob. For what it's worth, my sister walked out of this movie. She couldn't tolerate the animal abuse scenes in the beginning of the movie. I didn't read the book or see the movie. Don't really care for Reese either. I can totally understand why your sister walked out. There were parts that were awful...but since I had read the book, I was expecting it and covered my eyes and cried. But that also means I knew the ending.